Thai things, the things we see and experience every day in Thailand, be it spiritual, religious, fun, or what appears to be plain old daft to foreigners, it’s good to know what you are looking at. This way you can begin to know what makes Thailand and Thai people tick. 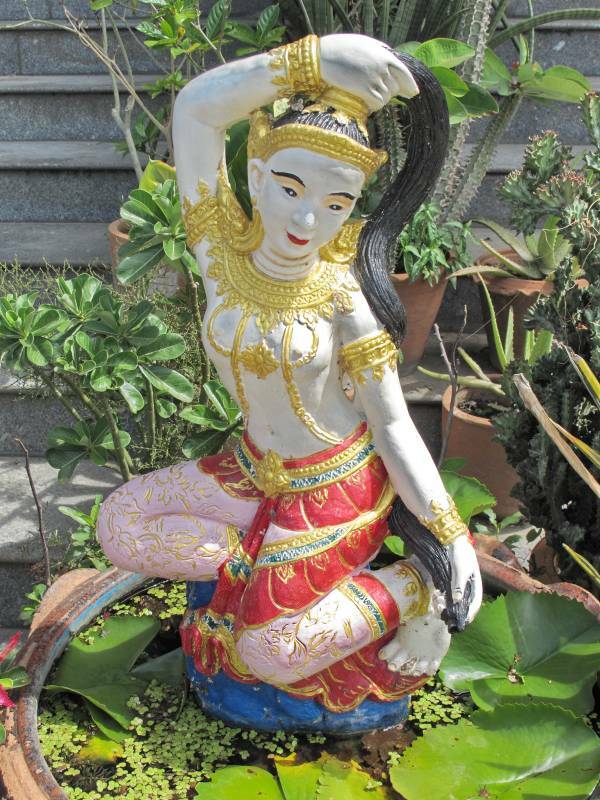 Mae Thorani, also known as Mae Thoranee, Phra Mae Thorani, Mae Phra Thorani, Nang Thorani, Suvathara or Earth Goddess, Often seen in gardens, shrines and temples around Thailand, Mae Thorani is more than simply a statue or garden ornament. 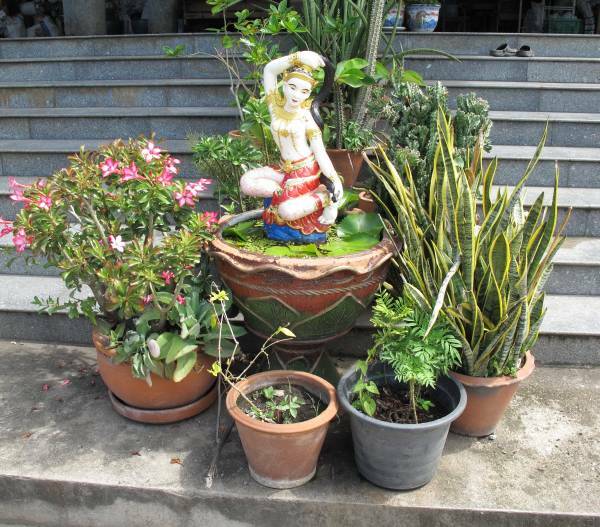 Mae Thorani is actually highly revered and worshiped in Thailand, for she is actually a Buddhist deity. According to legend. As Buddha sat underneath the Bodhi tree awaiting enlightenment he was challenged by Mara ‘the evil one’ and his army, Mara was jealous and did not want Buddha to attain enlightenment. Buddha reached down to the earth with his hand and summoned Mae Thorani, the beautiful goddess rose from the earth and taking her long flowing hair in her hands she wringed from it a torrent of water which swept away Mara and his evil armies. Usually, you will see Mae Thorani in a sitting pose, sometimes in murals she may be stood, often between Buddha and Mara, but she is always depicted wringing water from her hair. Just remember that Mae Thorani is not merely ornamental, she has spiritual significance in Thailand and many other South East Asian countries and therefore must be treated with respect.